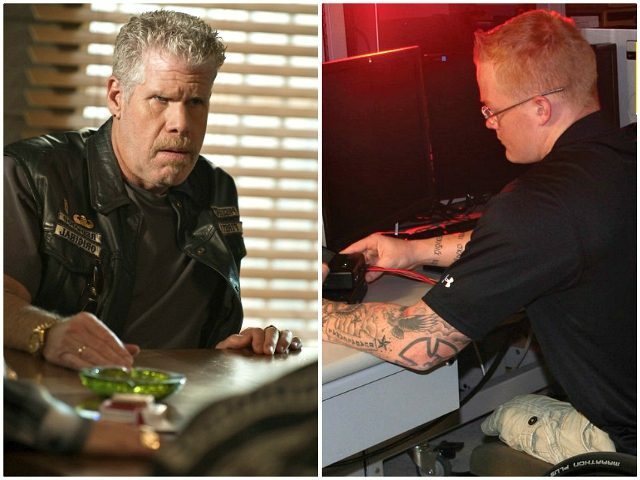 Actor Ron Perlman was forced to issue a halfhearted apology to disabled military veteran Justin Gaertner — and U.S. Immigration and Customs Enforcement agent — after saying his military tattoo was a Nazi symbol. The controversy began on Monday morning, after Ron Perlman discovered a tweet, from U.S. Immigration and Customs Enforcement describing the work of a disabled military veteran named Justin Gaertner who is still serving his country. “Learn more about HERO Child-Rescue Corps, a program for wounded, injured & ill Special Ops Forces to receive training in high-tech computer forensics & law enforcement skills, to assist federal agents in the fight against online child sexual exploitation,” read the ICE tweet, which was accompanied by a photo of Gaertner. Noting what he thought was an Iron Cross on Gaertner’s elbow, Perlman captioned the tweet and insinuated that the tattoo was of a Nazi Iron Cross. I know I’m a leftist, “D List” actor, so my twitter feed is probably deceiving me, but is that an iron cross tattooed on this hero’s arm? This is a mistake, right? Cuz the Iron Cross was a symbol of Nazi Germany. After Perlman’s remark, and dozens of tweets from other leftists attacking Gaertner and ICE for what they perceived to be a racist tattoo, ICE issued a statement clarifying the matter. As it turns out, Gaertner’s tattoo was not a symbol of “Nazi Germany,” instead, the tattoo is a symbol of “Titan 2,” the platoon Gaertner served in with the Marines. “Justin Gaertner is a combat wounded U.S. Marine who continues to serve his country as an ICE computer forensics analyst, helping solve criminal cases & rescue abused children. The tattoo shown here is the symbol for his platoon while he fought in Afghanistan,” the ICE tweet read. So not only is Gaertner not preparing to invade Poland, he’s actually an integral part of our country’s efforts to rescue abused children. Perlman offered a bitter and halfhearted apology for his mistake. My apologies! I mistook the symbol on this man’s arm before I actually knew the facts. So again, I apologize to the man in this picture for my mistake.